The ocean has been a constant in my life since my early childhood. For any number of reasons I've always been fascinated by the beach. I can remember at a very early age standing facing the ocean and looking down at the edge of the water and thinking "this is where the country ends, right there." The beach is an interface, a place where worlds touch. Out there is an alien place, one in which we can barely survive without lots of artificial support like oxygen tanks, submarines, wetsuits. Out there are animals which can't live up here, breathing air. They live down there, breathing water. Very strange. As a teen I worked at Marineland of the Pacific, a beautiful if always foundering aquatic park, the poor stepchild of San Diego's Seaworld. Every day I would go down the dolphin tank and pet the backs of the dolphins as they swam around in their prison. At the time I didn't feel bad for them, as I do now, it was just a fact of life that they were there. In junior high school I took an oceanography class and enjoyed it immensely. I'm not sure how it happened that I didn't end up working with, on, in or under the ocean, but that's the way it happened. I make up for that by trying to get close to it as often as I can. I have surfed on it, sailed on it, swam in it, snorkeled under it, lived next to it. 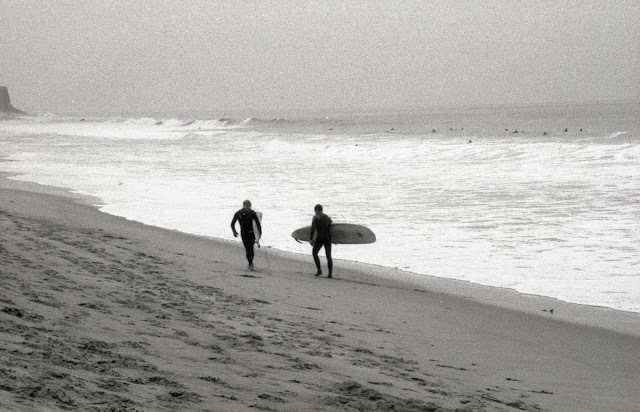 For a time I lived down in Playa Del Rey in a tiny rented room that was steps from the beach. Every time a wave would crash down my bedroom door would rattle. It would soothe me to sleep. Beaches are not friendly places for cameras. Sand is just really small rocks. When it gets into a delicate mechanisms "bad things" happen. Similarly, salt water is quite possibly the most corrosive thing short of acid. Cameras don't do well at the beach. I once bought a Nikon F4 that had clearly lived its entire life at the beach. I sucked about a tablespoon of sand out of that one. All that said, however, I always have taken my cameras to the beach. I have taken hundreds of pictures of waves, seagulls, sunsets, piers, pilings, sailboats and surfers and not once, (so far) dropped a camera in the sand. So I'll keep doing it, obviously. This photo was taken on a grey, overcast day at Point Dume. Point Dume is on the west side of a peninsula to the south (well, actually, east) of Zuma beach. The beach runs east and west at that point in the California Coast so, counterintuitively, one is looking south at the ocean. This particular photo might even be looking slightly east, of all things. I brought my beach dwelling Nikon F4 with me, loaded with Freestyle Arista Pro 400 speed black and white with my 70-210 Nikkor on the front. Freestyle Photographic Supplies is a store on Sunset Boulevard in Hollywood which carries lots of good stuff, in particular the eponymous film. Good stuff this. Some say it is rebadged Kodak Tri-x, but I'm not gonna contribute to that argument. All I'll say is that it is great film very reasonably priced. So why this photo? Lots of reasons. I don't know if you can tell, but all those little black dots on the ocean in the background are surfers. There were about a hundred of them out there. There were longboards and shortboards, boogieboards and bodysurfers. This particular pair of guys had just come ashore after spending a fair amount of time out in the water. If you've ever surfed then you know that the transition from bobbing in the water, gliding on waves to walking on the beach carrying your board is a strange one. In the water you are practically weightless, and your board IS weightless, after all, it floats. On the beach you are just tired, thirsty and uncomfortable, with sand in your wetsuit and salt in your eyes, lugging a heavy board up to your car where you can strip down and towel off. These two guys are middle aged. The one on the left is sporting quite a head full of male pattern baldness. Yet there is energy in their walk. They've just come out, tired, but happy, from a morning of riding waves. The day was grey but their spirits are bright. They've been recharged by spending some time out there in the water, and I suppose I was just a little bit envious of them. I also went to the beach today, so it was on my mind tonight.